I have been wanting to host a tea party type of event and this year Easter was the perfect occasion. We were just having a couple of people over so I did all sorts of small bites. So fun and classy! The cucumber rounds were one of my faves! They were so light and refreshing and reminded me of the typical cucumber sandwiches you would have at a tea party, minus the rye bread. These are definitely the perfect snack for bridal showers, baby showers, or an afternoon tea. In a medium bowl beat together the cream cheese, dill, pickle juice, onion powder, garlic powder, pepper, and green onion until smooth. Transfer the mixture to a pastry bag or a Ziploc bag. 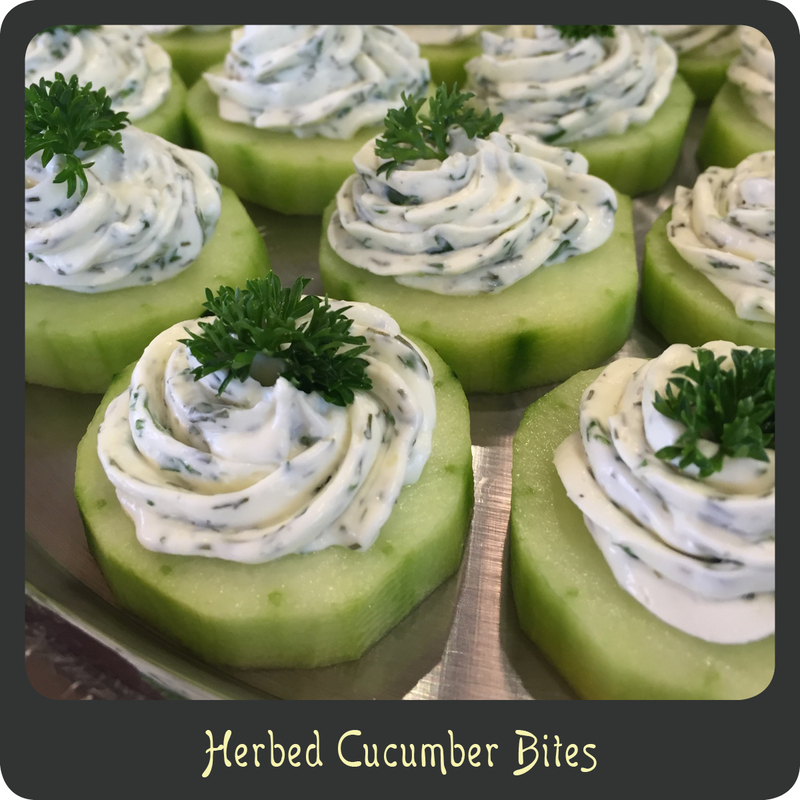 Pipe the herbed cream cheese mixture onto each cucumber round. Garnish each cucumber with a sprig of parsley on top. Serve immediately or cover and store in the fridge until ready to enjoy. Tomatillos are one of those things that I am just figuring out what to do with. I remember as a kid peeling the husks off them all summer long since my mom grew them in her garden but all I remember her really making was her tomatillo salsa. Every once in awhile I end up with a small bag of them from a friend or our produce delivery. Never enough to actually make a whole batch of salsa with. But now I can say I have two recipes that use tomatillos. One is my green chicken chili, which I promise to post soon, and the other is this incredible Creamy Tomatillo Chicken recipe. If you can prepare the sauce the night before it is perfect for a busy workday. Just come home, take the marinated chicken out of the bag, and bake. 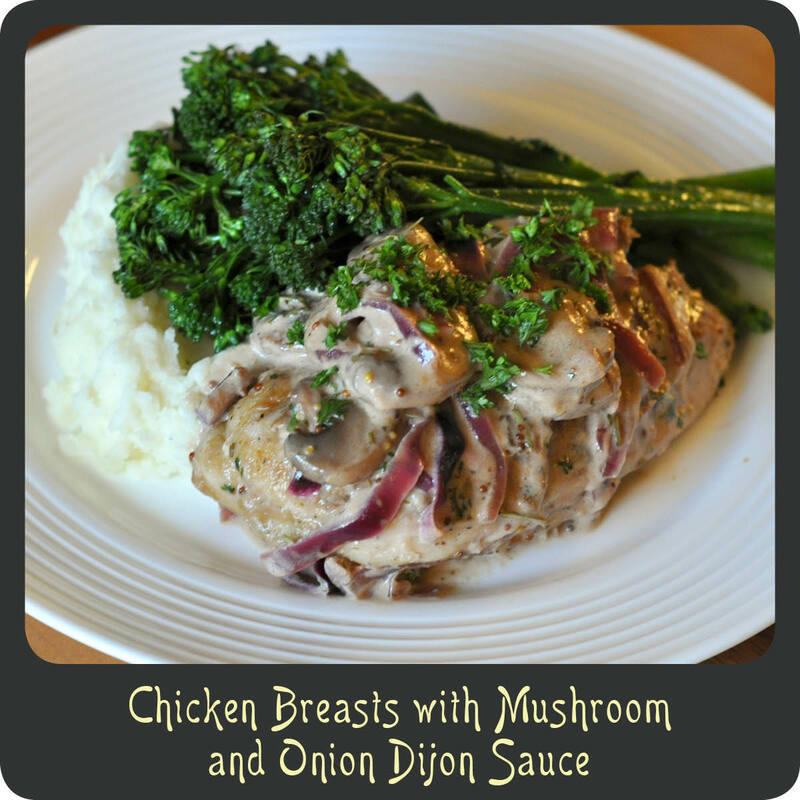 After marinating for that long you are sure to get a super juicy and flavorful chicken breast. 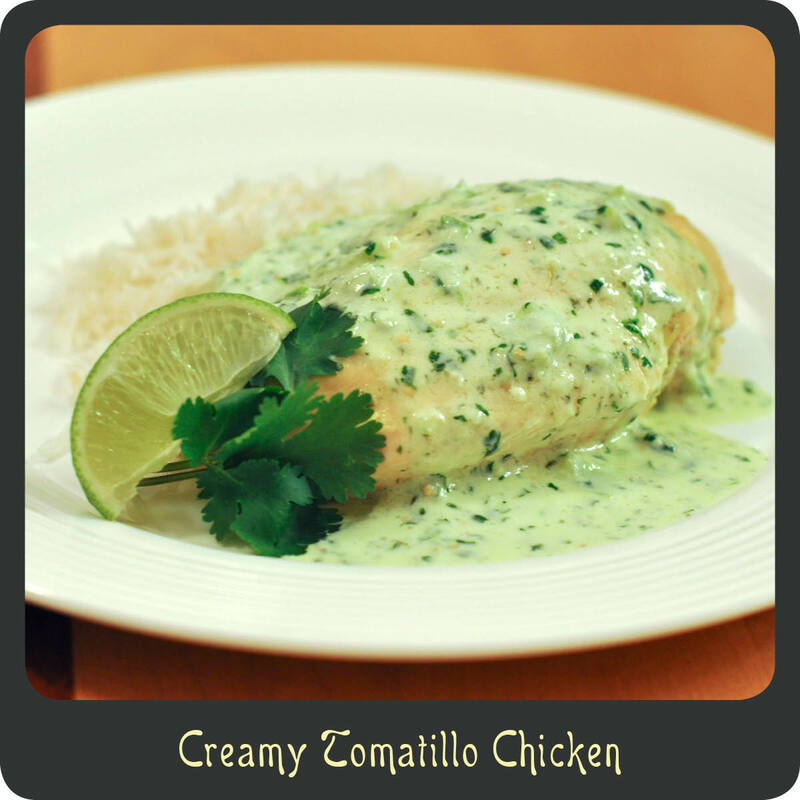 The ranch gives it a nice refreshing quality while the cilantro and lime give it a little zip! While I served this with rice which was awesome, I really want to try the chicken chopped up over some greens with corn, black beans, and some red bell pepper. The sauce would make for an amazing dressing over a little southwest salad! Add into a blender the mayonnaise, buttermilk, ranch dressing mix, garlic, cilantro, tomatillos, and lime juice. Blend until well combined and transfer about half of the mix to a one-gallon Ziploc Bag. Add the chicken to the bag and seal tightly. Store the chicken in the fridge and marinade anywhere from 30 minutes to overnight. Transfer the remaining marinade in a small bowl, cover, and place in the fridge until ready to serve. When ready to begin cooking preheat the oven to 375º and transfer the chicken breasts to a baking dish. Dispose of the leftover marinade. Bake the chicken for 20–25 minutes or until cooked completely through. Transfer the cooked chicken to the plate and poor the additional sauce over the top. Garnish with a lime wedge and some fresh cilantro leaves. Recipe adapted from Creme de la Crumb. Something about cooler weather makes me crave comfort food. I just love a good hearty meal on a cool night. 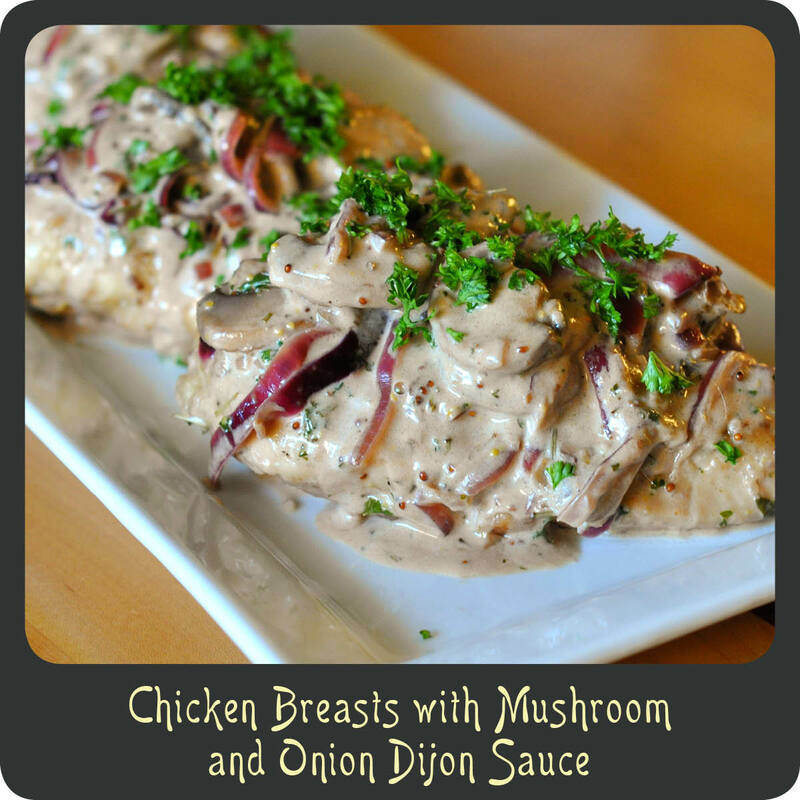 My chicken breasts with mushroom and onion Dijon sauce is one of those delicious and soul warming meals. This is a sophisticated recipe that is just absolutely wonderful. The sauce is rich and creamy and really allows the flavors of the fresh herbs to come out and complement the zestiness of the mustard. 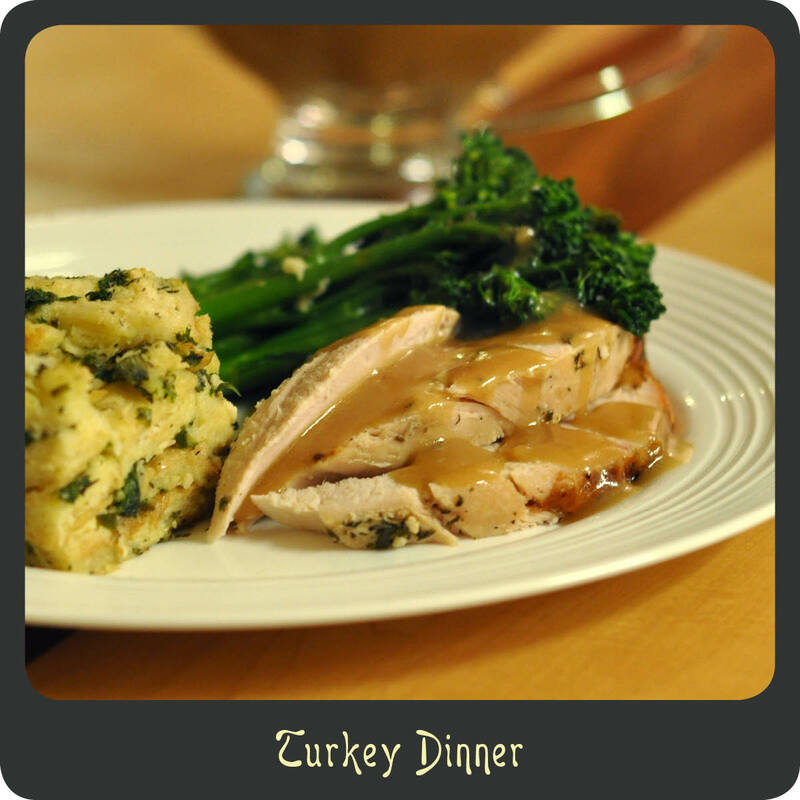 With the holiday season approaching and people getting together this is the perfect dish to prepare for a small group. This recipe comes together relatively easy and you are sure to impress your guests with your culinary abilities. Note: If you are feeding more than four people consider butterflying the breasts or even getting thin breast cutlets at the store. If you use a thinner breast you will need to adjust the cooking times for the chicken slightly to avoid overcooking. In a large Ziploc bag mix together the flour, salt, and pepper. Add the chicken to the bag and toss to coat. Heat the olive oil in a large skillet over medium-high heat. Remove the chicken from the bag and shake off excess flour before placing in the pan. Cook the chicken for 4–6 minutes per side and transfer to a platter. Add the mushrooms to the pan and cook for about 5 minutes making sure to stir a few times. Add the sliced red onions and rosemary to the pan and continue to cook for 3–4 minutes. Mix in the mustards and wine and gently scrape the bottom of the pan making sure to get everything well incorporated. Add in the parsley, broth, cream, and butter and mix to combine. Place the chicken back into the pan and spoon the sauce over the top. Reduce heat to medium-low and cook at a simmer until the chicken is cooked through. Transfer the chicken breast to a plate and spoon sauce over the top. Sprinkle with a little chopped parsley garnish for some added color. Recipe adapted from A Family Feast. 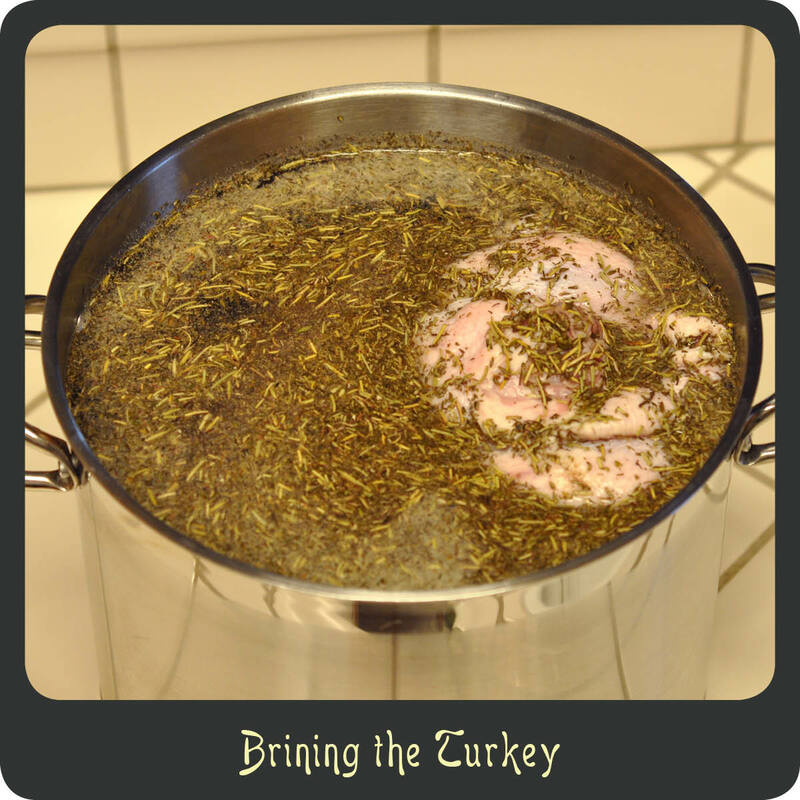 Brining is the process of soaking your turkey in a salt (and sometimes herb) infused bath for several hours prior to cooking. I find that your bird will be more evenly flavored and it will also be the moistest bird you ever have. 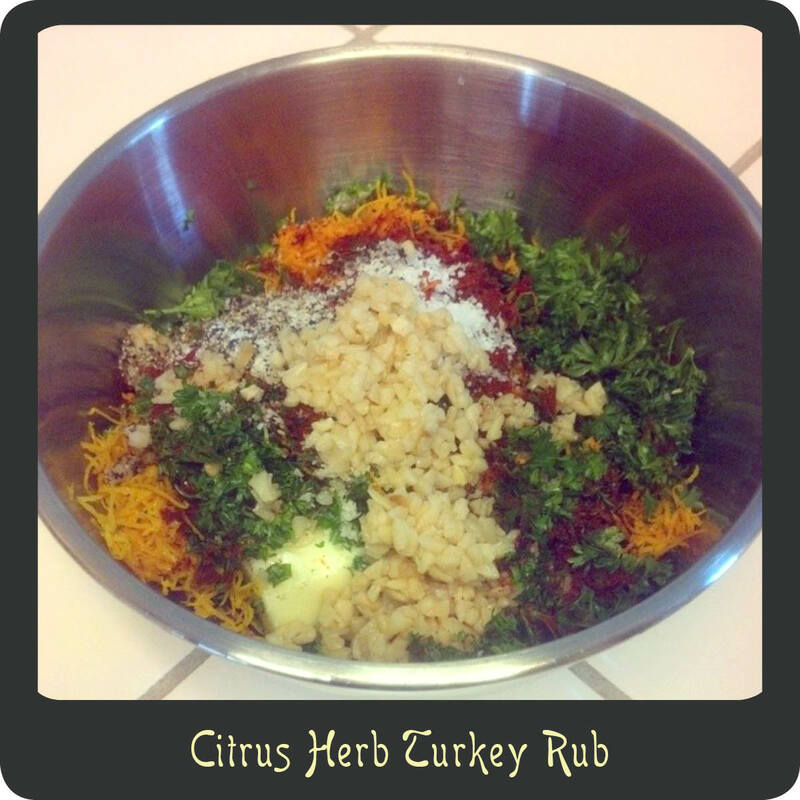 I make an awesome citrus herb rub (see recipe below) for my turkey. It is flavor packed and will make all your dinner guests ohhhh and ahhhh. The orange zest is not overpowering at all. It actually is a really nice complement to all the other flavors of a thanksgiving dinner. Trust me. I know how to make a delicious turkey. Notes: Do not brine your turkey if it is self basting, pre seasoned, or kosher. If you do not have a pan that is large enough you may use an oversized bowl, ice chest, or even a baking bag tied off. The key is that the bird is completely submerged. Find a large pot that will hold your turkey making sure you have at least an inch or two of room at the top. Bring 4 cups of water to a boil in your pot. Add the salt and sugar and stir until completely dissolved. Remove the pan from heat and add in 8 cups of cold water, apple cider vinegar, sage, thyme, rosemary, and pepper. Place the pot in your sink (this will help in case any liquid overflows). Remove all of the giblets and neck from your turkey and gently lower it into the pot. Cover the pot with a lid or saran wrap. Place the pot in the fridge and marinade for 12–16 hours. In a small bowl combine the garlic, parsley, kosher salt, pepper, chili powder, orange zest, and butter and mix until well combined. Starting from the neck of the turkey, carefully separate the skin from the breast meat with your fingers. Use the other half of the mixture to evenly cover the top and sides of the turkey. Place the orange quarters inside the turkey’s cavity. Place the seasoned turkey in a roasting pan and loosely cover with foil. Remove the foil for the last 45 minutes of cooking. 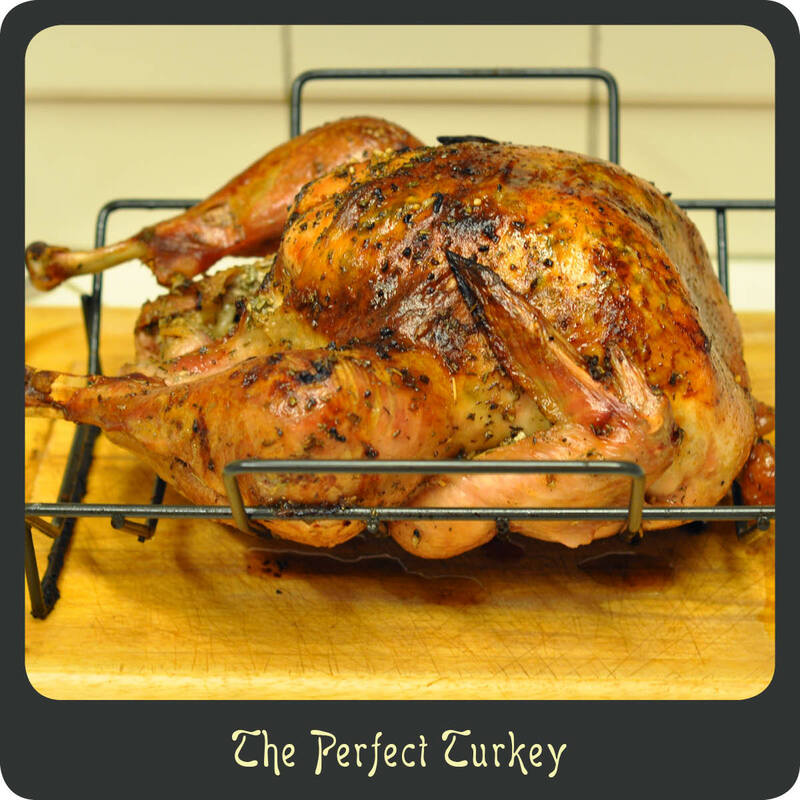 When the temperature in the meatiest part of the turkey reaches 165º remove it from oven and allow it to rest for 25–30 minutes. This was a side dish I recently made for Sunday brunch. It was easy, delicious, and made for a great presentation. Ham and asparagus has always been a classic combination and when you have the nice mild bite of Dijon mustard along with a creamy cheese sauce it’s suddenly even a little more fabulous. Be sure to bookmark this recipe if you are like me and always looking for brunch ideas. It is sure to be a great addition to any menu. Perhaps a Father’s Day brunch item? Note: I prepared the asparagus rolls the night before and refrigerated them ahead of time. Then the morning of I just had to put together the sauce and bake it. One less thing to be dealing with in the morning. Trim off approximately 1″ from the cut ends of the asparagus. Steam the asparagus for approximately 3 minutes or until crisp tender. Season the asparagus with salt and pepper. Spread a tad of the Dijon mustard on one side of each slice of ham. 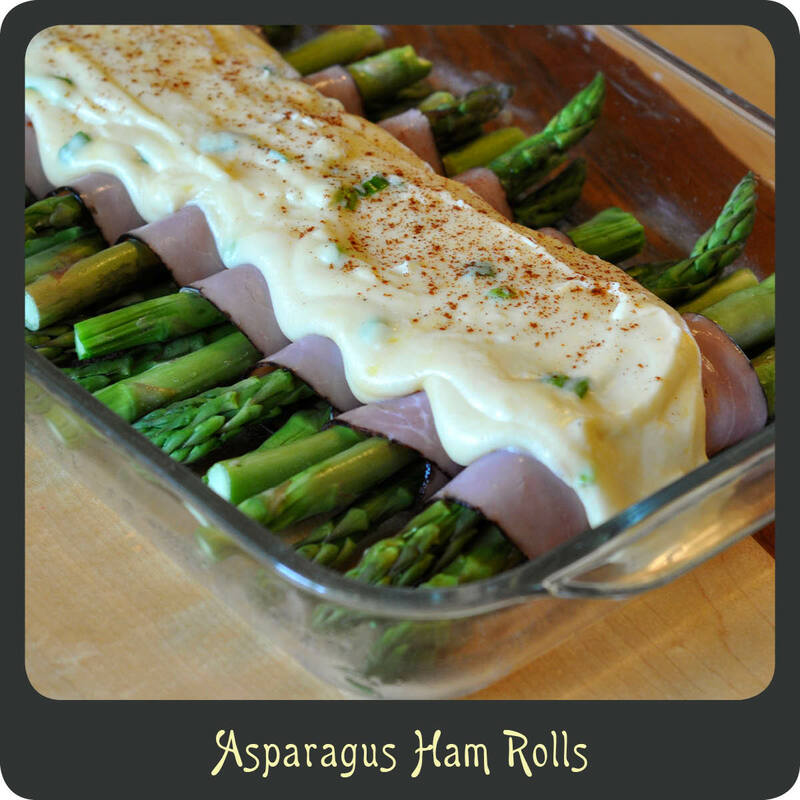 Place 3 spears of asparagus on each slice of ham and roll up. As you finish each one place them seam side down in a greased baking dish. Once you have prepared all the rolls get started on the sauce by melting the butter in a small sauce pan over medium heat. Mix in flour until well combined. Slowly whisk in milk, season with salt and pepper, and bring to a boil. Cook for 2 minutes until it begins to thicken. Stir in the cheese and green onions until cheese melts. Pour the sauce over the asparagus rolls and sprinkle with a dash of paprika. Recipe adapted from a Taste of Home. Over the past year or so I have been using pesto more and more. Last summer we got a massive amount of basil from our garden, which yielded lots and lots of tasty homemade pesto. I was able to freeze tons and use it throughout the whole year. Awesome! I have found that pesto actually makes a really great marinade. 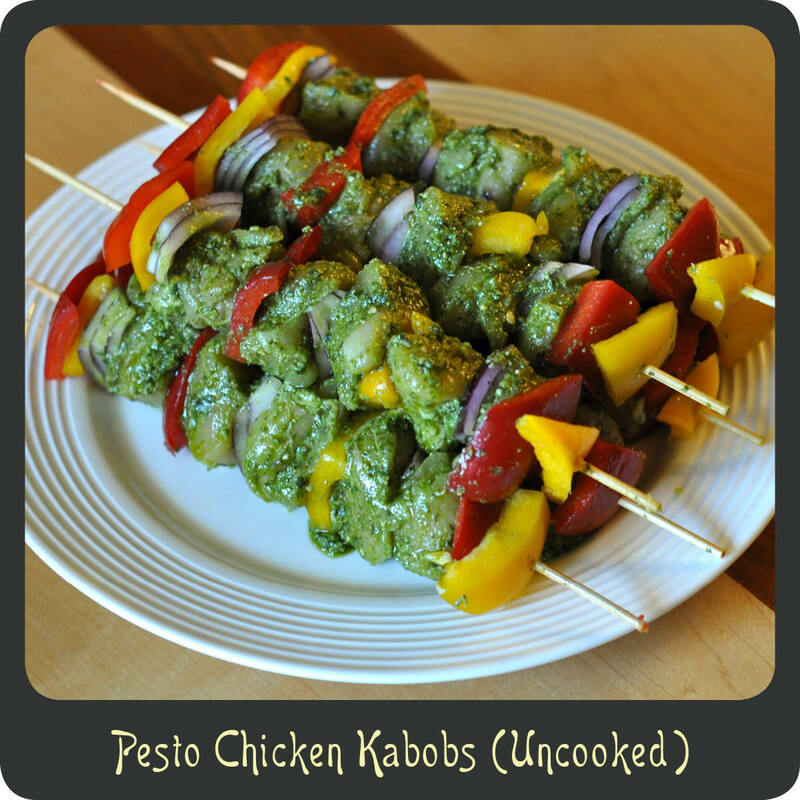 Recently I am totally hooked on pesto chicken kabobs. Not only are they super fun to eat but they cook in a fraction of the time. Perfect meal for this coming summer. Tip From the Diva: When using wooden skewers, soak them in water for about 10 minutes before putting all your goodies on them. It keeps them from catching fire and are much easier to handle. Genius right? Season the cubed chicken with salt and pepper. Place in a container and toss with the pesto. Thread the meat and the veggies onto the skewers making sure to alternate and discard the leftover marinade. 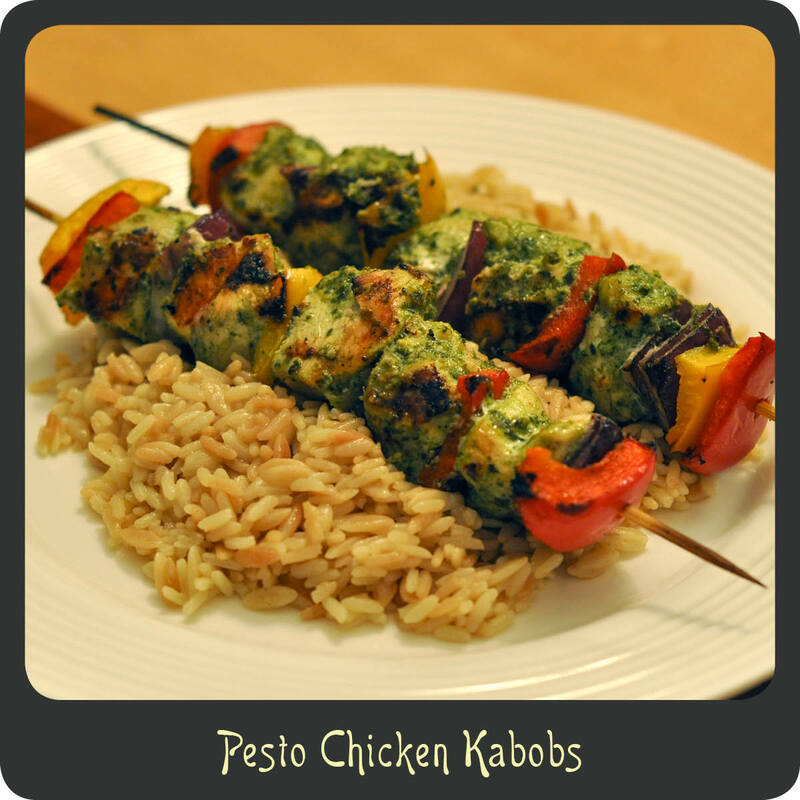 Grill skewers for 10 minutes, turning as needed, or until meat is cooked through and vegetables are tender. 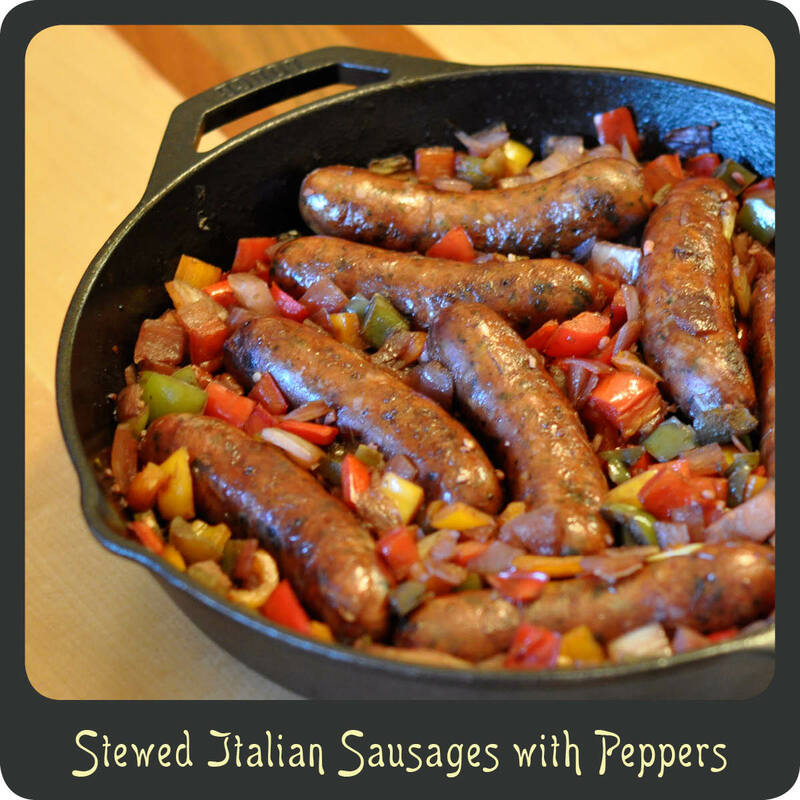 Perhaps it’s the Italian in me but I absolutely LOVE a good Italian sausage with peppers and onions. Ta-sty! This is a recipe I tried awhile back when I was trying to trim down on my carb consumption. 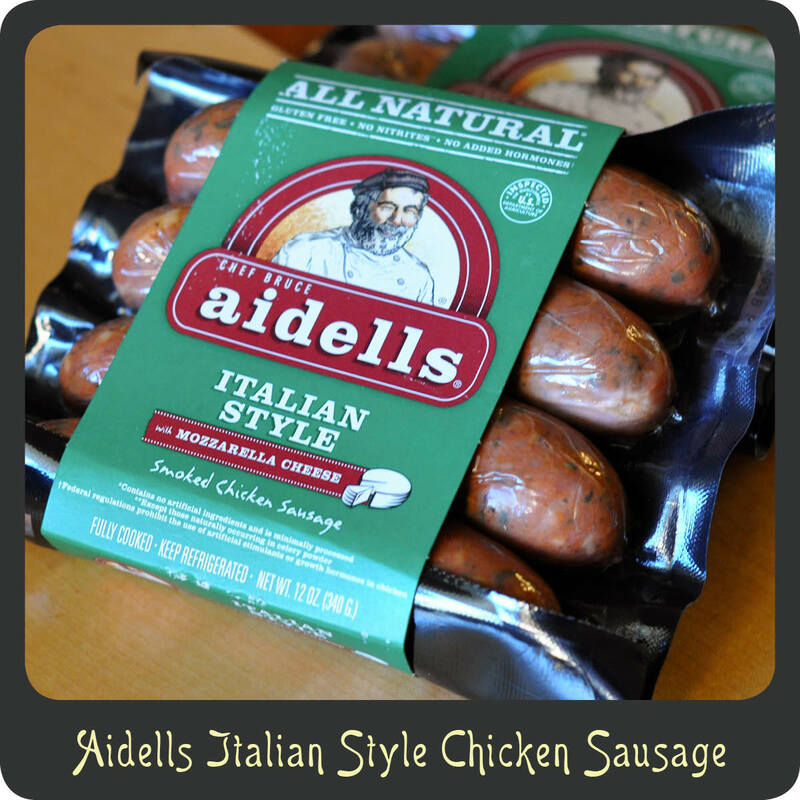 You can use any Italian sausages but I really like Aidells Italian Style Chicken Sausages. They are flavor packed and the chicken helps cut down on some of the calories from the traditional pork or beef. The whole family loved this recipe! For those not watching their carbs, I served it with some crusty French bread and it was a perfect meal! Quick, easy, and delicious. That’s my style! Note: The sausage and veggies are absolutely awesome in a sandwich too. Just grab a pack of sandwich rolls, load ’em up, and chow down! Heat 1 tablespoon of the olive oil in a large skillet over medium high heat. Add the sausage and cook turning frequently until they turn a nice golden color and are cooked through, about 15 minutes. Transfer to the sausages to a large plate and cover with foil to keep warm. Add the remaining 3 tablespoons of oil to the skillet along with all the veggies. Cook stirring occasionally until the vegetables are softened, about 12–14 minutes. Season the veggies with salt and add the sausages back into the skillet. Add the wine to the skillet and bring to a simmer. Continue to cook for about 4 minutes or until the wine has reduced by about half. Sprinkle with the grated parmesan and serve. Recipe adapted from Food and Wine.